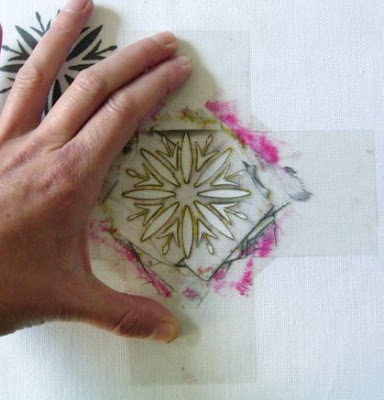 A quick way to 'screen print' in a small space without a silkscreen. It's stenciling, really, but then so is screen printing, if you think about it. You'll need a flat surface for the (fabric silkscreen) ink and a credit card. Yes, credit cards can be useful! A stencil. Mine is cut from acetate; thickish paper would also work, but won't last as long. This stencil is a cross shape because it's also a nifty registration device. If I line it up just so, the prints end up neatly arranged in a geometric pattern. (Smug, me?) The design needs to be small enough for you to hold down with one hand. 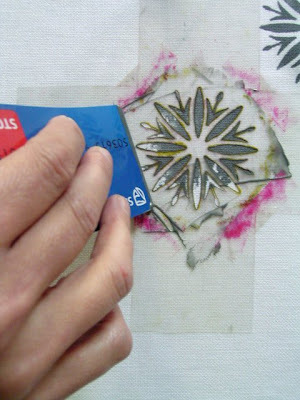 Hold the stencil down firmly, and scoop up some ink with the credit card. Scoop generously! 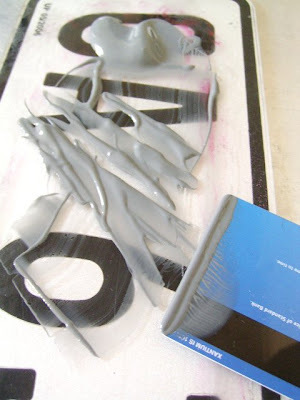 Pull the ink lightly across the stencil (keep holding the stencil down - I let go to take the pic). Don't press too hard, otherwise the stencil will move, or ink will bleed under it. You can swipe across it a few times to cover it properly, adding more ink each time. Because it's not covered by a silk screen, you can see whether you need to add more ink - phew! Perfectly printed. Peel the stencil off carefully. I did some 'proper' screen printing today too, and .... I just don't know what I'm doing wrong. Apart from not having an expensive squeegee and clamps to hold the screen. I do love this design, and it sells well, but printing it is a nightmare. Perhaps it's simply too big? I printed 8 prints to get 4 good ones, and while I'm the kind of person who'll painstakingly touch up a print with a paintbrush, I know that isn't cost-effective. With block printing I get variations in the print, but they're all good prints. 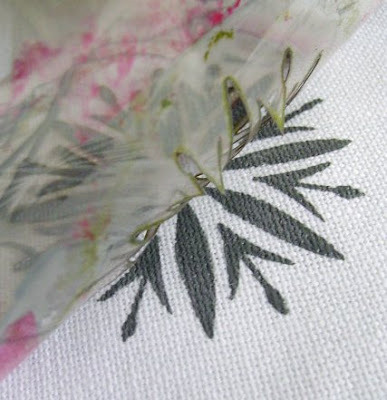 With silk screening, there's just good prints and bad prints, nothing that could pass for 'interesting variation'. Another concern is the amount of water needed for clean up, and the amount of ink wasted. The ink that stays behind on the screen ends up being washed down the drain, along with enough water to keep a small garden going for a few days. Is there a more practical way to clean up? Perhaps silk screening really does only make sense for large quantities? No practical advice here because I've never done any silk screening (something I plan to change soon), but I love the design. The use of the credit card for a small design is genius! me oh my - that is all sorts of incredible and clever! can't wait to try it out. no screenprinting advice, but I can totally see how that teatowel design would *not* lend itself to imperfections...lots of fine detail. The result is really beautiful and I love how easy it is! Very inspiring, I'll be linking. no advise for silkscreens- i have never done one, been dreaming of it for ages though. I agree with you about screenprinting. You make so many mucky prints that it's only when you've done lots that the good one outweigh the bad - unless you're very, very good. And the cleaning up etc is a pain. I don't know if this is helpful, but here it is anyways. 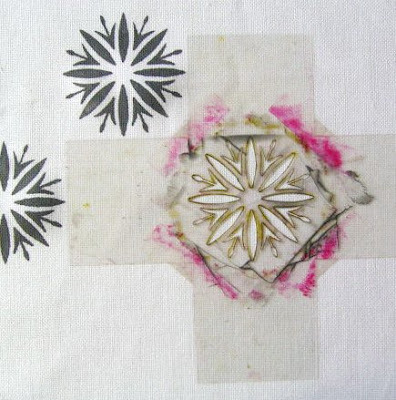 I think if you are using a stencil in screenprinting you might want to try using freezer paper (perhaps you know about freezer paper already? here is a tutorial:http://www.neitherhipnorfunky.com/?p=106)It is thinner than acetate and can last longer than paper stencils. There are also special sticky films for this purpose, but for short runs you can also use plain paper. These books might be helpful too:http://www.amazon.com/Lotta-Prints-Anything-Potatoes-Linoleum/dp/081186037X/ref=sr_1_1?ie=UTF8&s=books&qid=1248288623&sr=8-1 and http://www.amazon.com/Encyclopedia-Printmaking-Techniques-Art/dp/076240258X/ref=sr_1_26?ie=UTF8&s=books&qid=1248290798&sr=1-26. The second book gives good examples of stencil screenprinting! Whew! Man I have alot of potential printing energy, I need to turn it into kinetic! A thinner stencil could well solve some of the problems! I haven't seen freezer paper here, but apparently drafting film works well, so I'll try that next. Thanks! Thanks for the tutorial. Does it have to be silkscreen ink? Can you use just fabric paint? You can use fabric paint - the stuff I use is sold as both, depending on what you ask for at the shop. Good point about the freezer paper and re-using it. Acetate is quite tough. Beautiful prints and thanks for the inspiration! Hi Jesse! These are great tips, thanks! 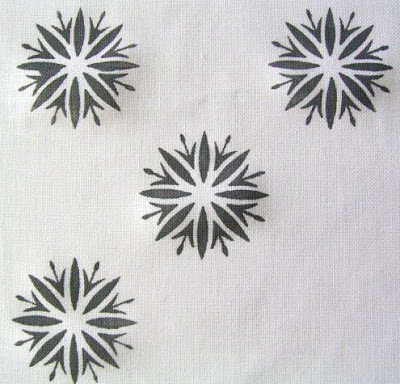 I have some stencils and will be trying this soon with some of my fabric paint. Love the result. Just beautiful. You do it look so simple. Your credit card 'squeegee' and registration method are both pure genius Jesse! I agree with you re wash up hassle with screen printing. Drives me nuts actually! The only thing that makes it easier is when I use a small screen and try to guess how much ink I will use (not always possible). As for stencil materials, I'm using drafting film at the moment and quite like it. I have found the quality of the screen (as in the silk) can affect printing. I have one good, one not so good and I can tell the difference when I print. Wow. What a beautiful result. I managed to get some freezer paper from my local patchwork and craft shop. I haven't tried it out yet - still on my to do list! I feel the same way about silkscreening . .the clean up takes so much water, and I feel like I am wasting so much ink. I try to scoop it back, but it's still a mess. Such a pretty pattern. A spatula of the sort used for scraping the bowl when baking can be very useful for "reclaiming" ink. You can store acrylic ink mixed with printing medium in a screw-top jar (for years, I understand) so maybe this would help with your leftover screenprinting ink? And you would have colours ready to use for next time. That was great tutorial and i was wondering cant we use a brush instead of using a card?? Are you using a frame with metal mesh when you print? I have been silkscreening for years, and that is the one thing I can't live without. They are a little expensive, but they last forever and make an enormous difference. I bought 3 almost 4 years ago and am still using them on a regular basis - they occasionally need to be bleached to make sure they are clear. But with a super fine mesh, you can print almost anything. I also use the acetate method for small print runs. Sadly though, I don't have any advice about using less water. It fills me with guilt every time I print!! And I LOVE your work - I have been following you for some time now and your stuff is really amazing!! Just a thought but why not use a stencil brush for a small design. Less clean up. I'll investigate a better screen - thanks! You could use a brush, but stencilling like this is actually faster. It also looks more like screen printing; I tend to get a ragged edge to the prints with a brush. I've always been so scared of stenciling, but this looks manageable, even for me! (a compressor helps with the water waste in silkscreen cleaning, but not with the chemical concerns. We´ll just have to invent some kind of ecological ink, right? Beautiful stencil prints! I'll have to overcome my poor X-acto knife skills and try this. Use waaay more ink than you think you'll need. You can save the excess again and again until it's all gone! And if you scrape all the ink that's humanly possibly to scrape off the screen, you cut down on resources needed to clean the screen. 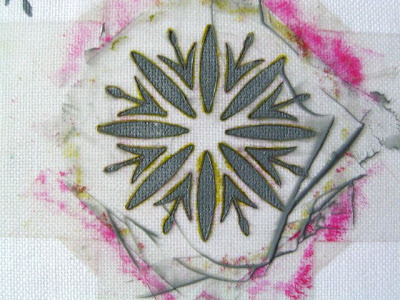 OH, and do you pull the ink across the screen before laying it down on the fabric? Flooding your screen is VERY important for a clean print. And just the other day I came across, Print Liberation, a book about silkscreening at home that's very very good! Jezze, what about making the design into a thermofax screen? It's the same principle as 'grown up' screen printing, works with the credit card and same inks, is easy to register and clean up is quick. Just a thought! I completely forgot about flooding the screen! Thank you for the reminder. I have always wanted to try using a thermofax machine - but I have never come across one. I've also heard that they are super expensive. Please post any results you have, if you get the chance to try one. I'd love to hear about it!! And I sacrificed a credit card the other night, right after I read your post about it - it works so well!! Especially for tiny prints, you don't get ink all over the place, so much better for control. I have been printing with thermofax screens for years. To reduce washout waste, I soak the screens in a bucket of cold/room tempterature water overnight; much of the paint, usually acrylic, comes loose on its own. I rub the submerged screens gently with my fingers, do one more quick clean water rinse and dry. Try it. Wow, you make it look so easy and perfect! I just got a YUDU and making screens are turning out to be a real time/money investment. I'm gonna try some stencils to add fun detail variations to the screen designs. Thanks for the DIY! Now I've got all kinds of new ideas going. What a great idea! Thanks - can't wait to try it! One question - can you use the same type of ink on paper/card stock as well?? Hi! I've been screen printing small runs of about 20 prints for a year or so, the things I find make the most difference is the amount of adhesive I use to tack my fabric to print onto my table, and I also upgraded to a more expensive squeegee, it took me a while to adjust (I had really crappy prints for a while) but now my quality is much higher. Using table adhesive (re positionable spray glue would probably work)means you can flood your screen up to twice before making your final pass, and practice makes perfect!!! Great tip, Kate, thanks! I wonder if pinning the fabric to a base board would help too? I am completely blown away. printing is great. I don't know what else to say.